Earlier this week, about 14 bloggers (including me) were given the opportunity to interview actress, singer, and artist Paige O’Hara, the voice of Belle in Disney’s Beauty and the Beast. This was a dream come true for many of us; Beauty and the Beast originally came to theatres when I was about 9 years old. The character of “Belle” was the first Disney heroine that I remember really identifying with: she felt “odd” and “out of place” in her surroundings, she loved to read, and she had a thirst for adventure and excitement. When Paige O’Hara dialed in to the conference call, I got chills and a big, goofy smile spread across my face. In just a few minutes, I’d be asking a question to my favorite Disney princess. Yes, even after 20+ years, Belle is still my favorite. The story of Disney’s Beauty and the Beast holds magic for me, and my eyes get wet during the epic scene near the end when Belle races back to the castle to stop Gaston’s horrific plan. Now 21 years later, Beauty and the Beast is returning to theatres on January 13, 2012 in 3D for a new generation of children to enjoy. I attended a local screening of the film and took my 3-year-old daughter, who has long brown hair and brown eyes, just like Belle. Before she was given the role of Belle, she had auditioned for it 5 times. “I just felt really confident that it was my part and of course when the timing did happen and they said it was my role, I was just, that moment was a life-changing experience.” The same week she learned she would be the voice of Belle, Paige also became engaged to her husband, Michael, and celebrated her birthday. Paige has many other talents in addition to signing and acting. “I’ve been an artist since I was 3 years old,” Paige said, “but I’ve never actually been hired to be an artist so this is great.” Disney has hired Paige to create oil paintings of scenes from Beauty and the Beast for the Disney Fine Art Collection. 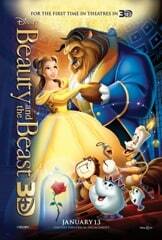 Beauty and the Beast is also a Broadway show in addition to an animated film. We asked Paige her thoughts on the transition from animated film to Broadway musical. “I think Beauty and the Beast was one that they captured really well…They went certainly for the more broad comedy of the Broadway – which I think was necessary for the audience that they had in the live production, I think the film still has more poignancy and more dramatic effect than the play did but the play was great fun and the most important thing is it brought people to the theater that normally would never go to the theater. Young kids that would have never even think about going to a Broadway play, but to introduce people to the theater with Beauty and the Beast I thought it was fantastic.” Paige’s husband Michael has even played Beast in L.A. onstage. Up next for Paige is a stage show of the life of Judy Garland. “Playing Judy would be a dream come true for me because she was my idol growing up, my favorite singer and actress, and I’m sort of at the place now where I’m physically – I’m ready to play her now. I have had enough life experience to understand her, and so I’m hoping within the next year or so we can get this back on its feet and maybe tour it and take it around the country and then I can portray Judy in a very positive light.” The musical is currently in revisions, and will cover Judy Garland’s life from the time she was 4 until her death.